Three UNIST researchers have distinguished themselves with inclusion in the 2017 list of Highly Cited Researchers, a yearly distinction released by Clarivate Analytics that was formerly part of Thomson Reuters. 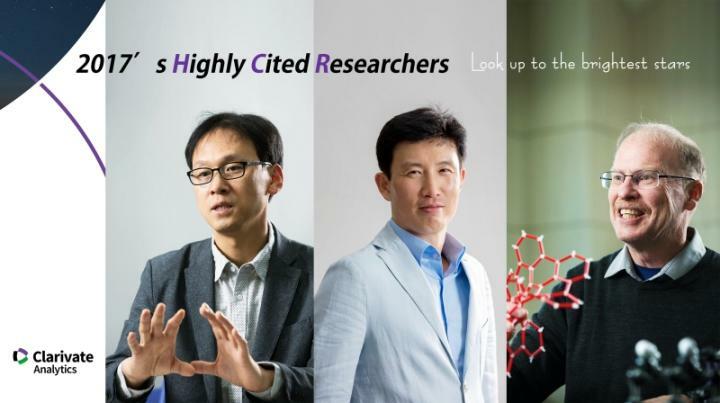 The latest Highly Cited Researcher listing by Clarivate Analytics recognizes leading researchers in 21 fields of the sciences and social sciences from around the world. The methodology included Essential Science Indicators to limit the disadvantage of recently-published papers relative to older ones, and to include early and mid-career scientists who may have fewer papers published. The yearly list is based on the number of citations for papers published over an 11-year period from January 2005 to December 2015. Highly Cited Papers are defined as those that ranked among the top 1% most cited for their subject field and year of publication, earning them the mark of exceptional impact. In 2017 edition, about thirty scientists from South Korea received this distinction in the 'Highly Cited Researchers 2017' report, which includes Professor Rodney S. Ruoff in the School of of Natural Science, Professor Jaephil Cho, and Professor Jin Young Kim in the School of Energy and Chemical Engineering. They have been listed among 3,300 researchers with global influence and impact. This is the second time both Professor Ruoff and Professor Cho have been named to the list. Rodney S. Ruoff, Director of the Center for Multidimensional Carbon Materials (CMCM) at the Institute for Basic Science (IBS) and Distinguished Professor in the School of Natural Science at UNIST was once again named as one of the world's most influential minds in all three fields of materials science, chemistry, as well as physics. Very few researchers earn this distinction and Professor Ruoff has been named three times, having done so previously in 2015 and 2016. Jaephil Cho, Director of Research Center for Innovative Battery Technologies and Professor in the School of Energy and Chemical Engineering, is known as the world leading expert on secondary batteries. Professor Cho has been named to 2017 Highly Cited Researchers List in materials science and this is the second time he has been named to the list. Professor Cho has published over 280 SCI papers and registered over 200 patents. He is in possession of ultra-fast charging battery technology and is working hard in the lab to commercialize the technology. Jin Young Kim, a professor in the school of Energy and Chemical Engineering at UNIST, has been also ranked in the top 1% Highly Cited Researchers in the field of materials science. Besides, this year is the first time Professor Kim made this list. Professor Kim is a leading expert in organic solar cells. The work he has published in the journal, Science in 2007 presents the novel possibilities for organic solar cells. In recent years, Professor Kim has received much attention for improving the efficiency of organic solar cells to 11%, thereby increasing chances of commercialization of flexible organic solar cells.